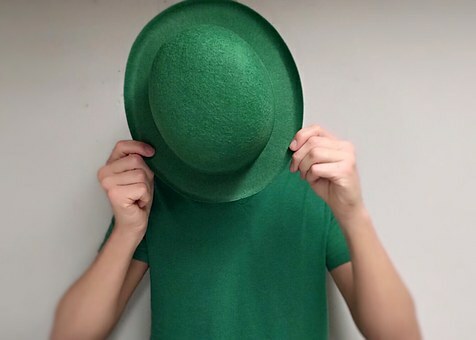 The Brisbane Irish Festival is a long-standing annual event promoting and celebrating St Patricks Day, Irish culture and its contribution to the state of Queensland. For the past 28 years, the St Patricks Day Parade has been held around the streets of Brisbane. 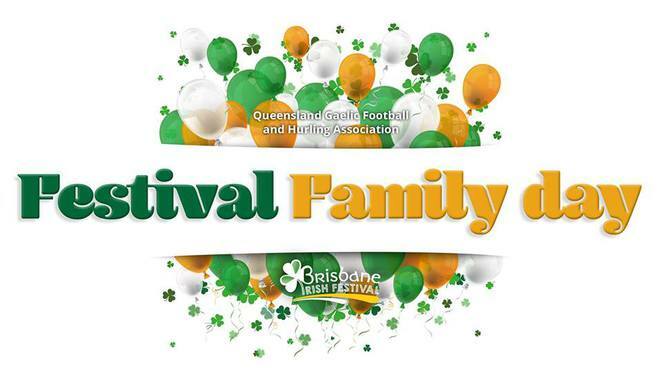 The inner-city district of Brisbane comes alive with the colourful convoy of more than eighty floats and displays representing Irish culture. The 2016 St Patrick's Day Parade attracted nearly 40 000 spectators into Brisbane's CBD and with live music and food stalls in the Botanic Gardens before AND after the Parade, this year is shaping up to be even bigger and better. 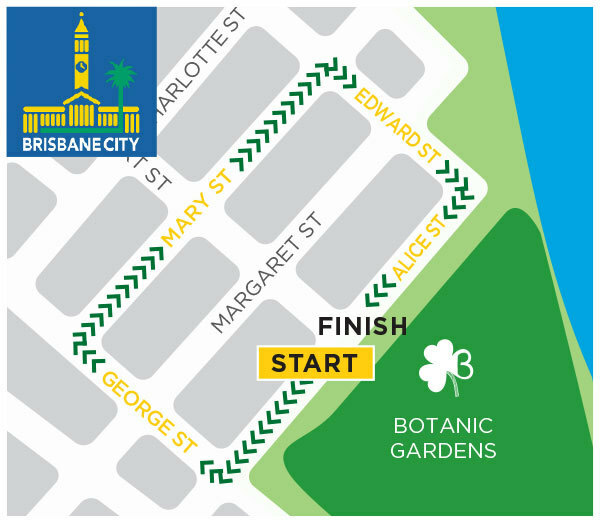 This year's Parade has a new route commencing and finishing outside the Botanic Gardens on Alice Street. If you wish to participate in the Parade, please click here for application forms. A sensational afternoon at The Brisbane German Club, 416 Vulture Street, East Brisbane, listening to the spectacular music of the QLD Irish Choir. 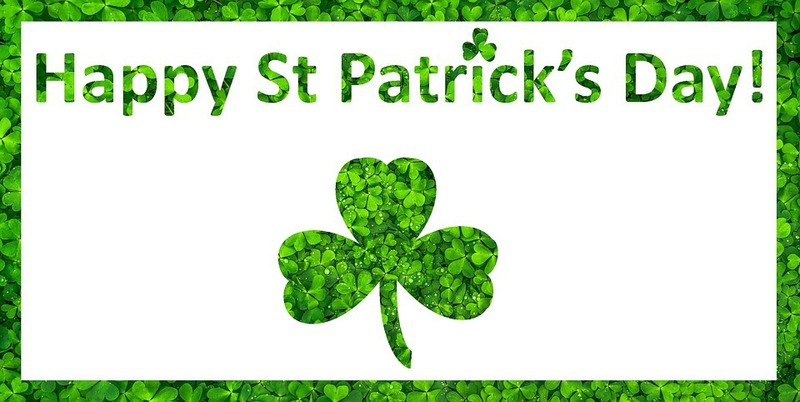 The Choir will be celebrating St Patrick's Day with the Irish Pipe Band and Irish Dancers. The cost is $15 which includes a scrumptious afternoon tea. You are invited to attend the St Patrick's Eve Dinner to be held at the Pullman Hotel (ex The Crest), corner Ann and Roma Streets, on Thursday, 16 March. 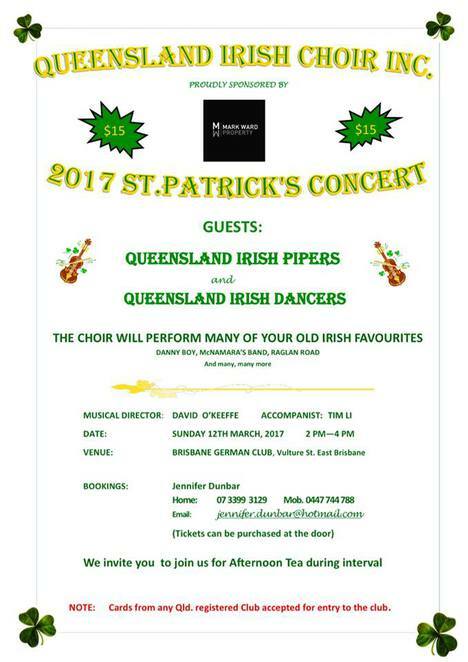 This dinner is the premier annual Irish cultural event and has been celebrated by the Queensland Irish community for the past 118 years. You will get to enjoy Guinness beer, wine and soft drink, excellent food, guest speakers and the camaraderie of this very special occasion. The cost of the dinner is $150 per person or $1500 for a table of ten. The official St Patrick's Day celebrations will commence with Mass to be held in St Stephens Cathedral in Elizabeth Street in Brisbane. A premium Corporate networking opportunity for Irish/Australian business and those with an affinity to Ireland - even if it's just for one day! The flagship Corporate lunch for the Irish Business community in Brisbane will be held at the magnificent Boulevard Room at the Brisbane Convention & Exhibition Centre in Grey Street, Brisbane. This Lunch will be hosted by Emma Hannigan with prominent speakers including Hon. Brendan O'Connor MP, Shadow Minister for Employment and Workplace Relations and former Australian Ambassador to Ireland, Dr. Ruth Adler. 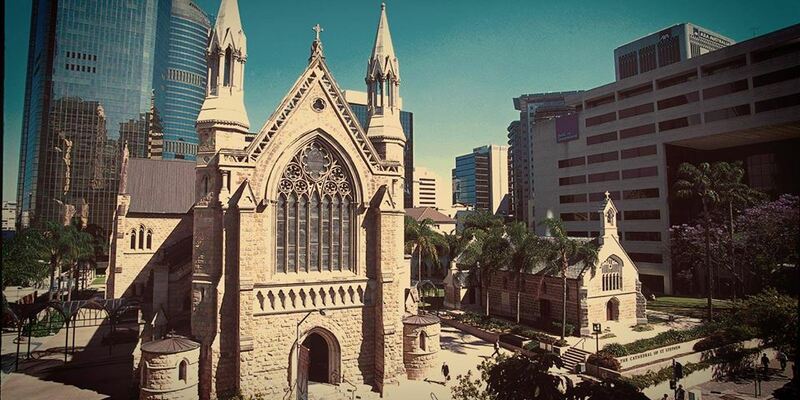 The Brisbane St Patrick's Corporate Lunch will have music, dancers, international visitors and the opportunity to come together in one of Brisbane's premium locations. A three-course lunch will be served, followed by more entertainment and post-lunch Networking on the Terrace with refreshments included until 5.00pm. The cost for the lunch is $1600 plus GST per member table. The Irish Festival Charity Ball will be held in the Ballroom of the Hotel Jen on Roma Street in the Brisbane CBD. At the time of writing this article, the author was unable to ascertain any further information. Please contact www.brisbaneirishfestival.com for additional details. The Annual Festival Family Day is a great family outing! The Family Day is hosted by the Queensland Gaelic Football & Hurling Association and is to be held at Gaelic Park, 308 Bowhill Road, Willawong. Fun for the whole family with childrens' rides, novelty races, live Irish music, QIA pipe band, Irish dancing, Gaelic sports exhibitions and tug-o-war. With a licensed bar and BBQ and the kitchen open all day, there'll be plenty to eat and drink. $10 entry for adults and children are FREE. Entry fee is to be paid at the gate. Unfortunately, no esky or furry family members are permitted. 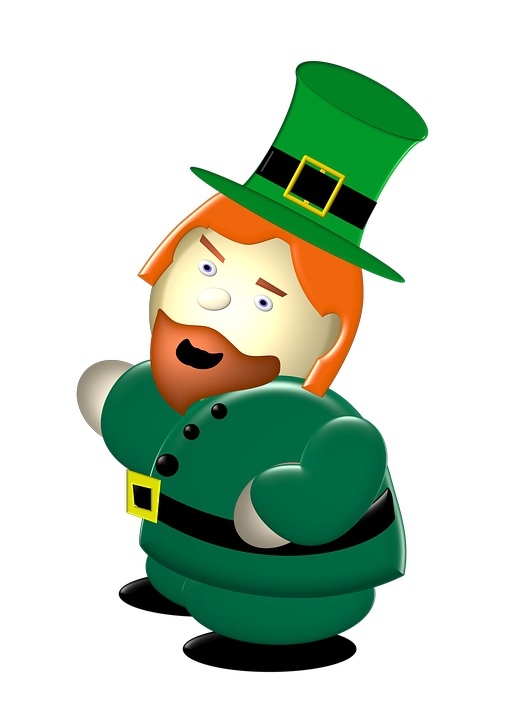 Thanks for providing St Patrick'sDay feedback. More info re where the great music coul be found would have been a help.